Staying regional doesn’t mean sacrificing on style, service and gluten-free toast, as we find out at Abode. Anyone who has booked a hotel room in a regional location in Australia will know that the remove in distance from, well, anything, can sometimes result in a remove in style and service. I’m not talking about resorts or lodges, of which there are some seriously fabulous examples across the country. No, I mean practical accommodation that can be factored into a journey to somewhere else or present a great option for a few days of discovery. 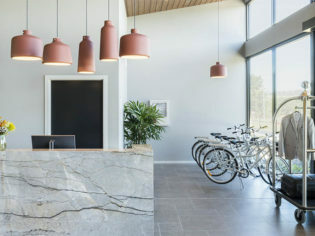 Maybe that’s why seeing images of Abode Murrumbateman’s chic lobby and pared-back rooms convinced me I needed to take the long way round to Canberra (via Yass) on a recent road trip. Arriving into Murrumbateman, which is smack in the middle of Canberra’s increasingly celebrated cold-climate wine region, Abode sits in between a new housing/commercial development and a pasture complete with cows. Having just driven through an endlessly captivating vista of faded green and taupe countryside, the outlook isn’t very inspiring but I’m hoping what’s inside makes up for it. Having parked just steps from the entrance (I’m a Sydneysider so I love this), upon entering the modern, low-slung building (by Canberra architect Hugh Gordon) I find myself in a cool, stylish space with cosy seating areas populated by furniture that would fit in perfectly in an inner-city boutique hotel and a fireplace that will be a great place to perch later when the crisp night air takes hold; a row of vintage-style bikes are lined up ready to be used to explore the surrounding cellar doors. Check-in is a delightfully pleasant experience thanks to the warm welcome. We are informed that breakfast can be delivered to our room or set out for us in the lovely communal kitchen adjacent to the lobby; we order the gluten-free option and decide on breakfast in bed the next morning. Our Terrace Room (there are 50 in total spread out in two wings off either side of the lobby) is spacious, modern and well appointed, with a subdued taupe, grey and wood aesthetic and big windows letting in lots of light; there is a small terrace area outside with seating for two. The bathroom has a rain shower, great lighting and pleasingly luxe bathroom amenities. Back in the lobby, we make the most of the kitchen, whipping up dinner using the state-of-the-art appliances and serving it all up on ‘wish-I-could-take-these-home’ plates and bowls that are generously stacked on the open shelves. If you didn’t make it to the supermarket before arriving, the Abode Pantry has shelves of ingredients and snacks to purchase, along with an impressive selection of local wines. After a great night’s sleep (the bed is extremely comfortable), breakfast arrives with little pots of yoghurt and berry compote, bowls of granola, fresh juice and crunchy gluten-free toast with preserves. It is a fitting end to a stylish stay that would give quite a few city properties a serious run for their money. 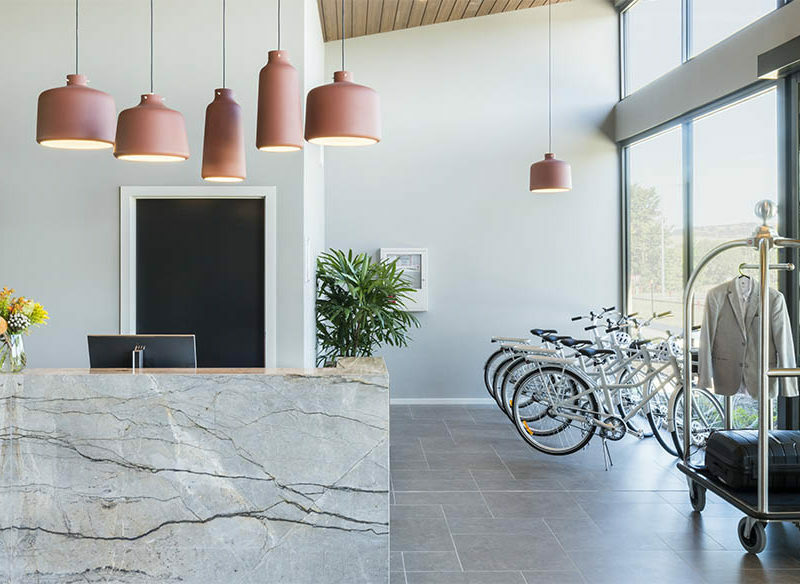 The stylish design, from the furniture used throughout to the lovely communal kitchen to the bikes, the welcoming staff and the generous breakfast delivered to your door. The one thing we would change we can’t; the outlook over a commercial estate and car park across the road is not ideal given the beauty of the surrounding countryside. We paid $159 for a Terrace Room including breakfast.